Home / Events / The day giant pumpkins came! The day giant pumpkins came! Every year for the past 20yrs, giant pumpkins have invaded a small part of Hampshire! The quiet Royal Victoria Country Park in Netley Abbey, normally home to dog walkers, joggers and others enjoying the views down across the Southampton waters, watching the ferries, container ships and cruise liners going to and fro, becomes home to the biggest pumpkin show in the uk. Pumpkins converge here from all over the uk, to take part in this massive event. I wasn’t too sure what to expect going to a pumpkin festival, never been before. It’s a massive event put on by the Jubilee Sailing Trust as a fundraiser for their great work allowing abled and disabled people to sail together. The cost of £5 per adult didn’t seem to expensive. As well as the pumpkins, there was many stalls selling local produce and promoting local events and good causes, a lot of these stands were selling pumpkin based products like homemade pumpkin soup and roasted pumpkin. This added a lot to the main event, which of course was the pumpkins and giant vegetables on display. This was sponsored by Thompson and Morgan, the great seed company. And wow just springs to mind! Just massive veg! Marrows weighing at 165lb, (make a lot of stuffed marrow that will) squashes at 457.3lb and the tallest sunflower I have ever seen at 18.81/2ft just massive! 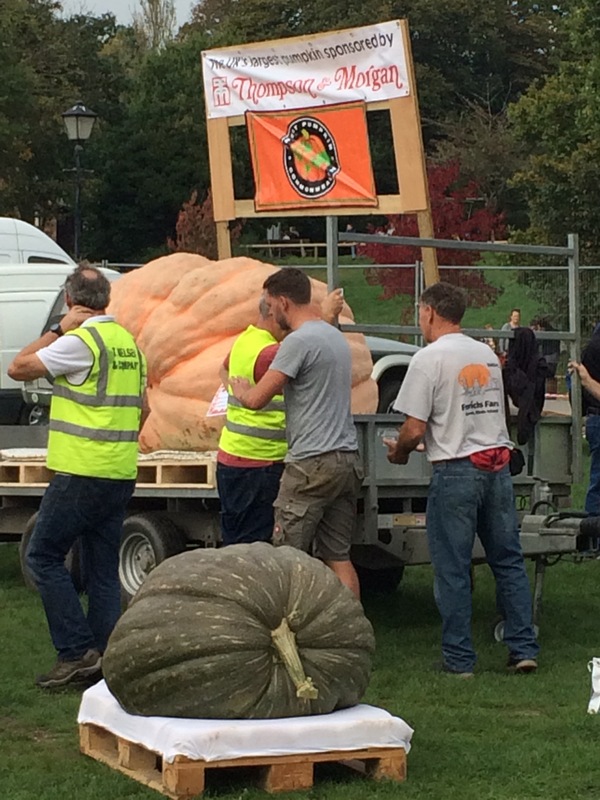 Then came the massive pumpkin weigh in. Now these guys are just massive! There was one that did shine head and shoulders above the rest. It just filled up the trailer! They had a great way of weighing these beasts, they had a specialty made bracket from which these straps hanged down from and with a rope around the bottom. They lower the straps and rope down over the pumpkin and tighten the rope once it was around the bottom of the pumpkin. It was then slowly lifted and then to a digital scale to get an accurate weight. The first uk record to fall was the uk outdoor grown Pumpkin. Grown by the excellent Matthew Oliver, he works as a vegetable horticulturist at the RHS Hyde Hall where this beast of a pumpkin was grown, now I have been following the pumpkins growth on twitter so was rather excited to see how big it really was. Well it smashed the record that Matthew had only just set a year ago, weighing in at a huge 1498.4lb he looked over the moon to say the least. The tension was slowly building up now to the weighing of the big big monster, would it break the uk, European or even the world record! One of those surely most go! The twin brothers, Ian and Stuart Paton from Lymington, have spent hundreds of hours in the last 4 months into producing this 100 gallons a day water drinking monster and you could tell the tension was getting the better of them, pacing up and down while the beast was carefully lifted, the underneath being checked to make sure it wasn’t hollow and thankfully it was solid, slowly this monster was put on the scales, the straps came off and the pumpkin was settled………… and the weight was called over a dead quiet crowd of a few hundred people 2269lb! A new British record!! What a fantastic achievement. The national press surrounded the successful brothers while we silently went home. The weight is being announced! We are always worried about getting people interested in horticulture and this just seemed such a brilliant event to get people interested in growing vegetables. Seeing so many people coming for exciting horticulture event, maybe this is the type of event the industry could use to promote itself a lot more. Many congratulations to Thompson & Morgan for sponsoring the giant vegetables and to the growers for spending so much time and effort in growth such monsters. I can’t help but think of the frustration when someone discovers the indoor-grown pumpkin is 2″ too big to go through the flippin’ door! Oh wow, thanks for the great photo’s. Amazing produce! Goodness! I did not realize this is in Hampshire. I read it as New Hampshire, as in next to Vermont! Oh well. We have big pumpkins here too, as well as in Massachusetts. The two regions compete actually. I happened to go to school with the Pumpkin Queen 1985 from Pescadero. The Pumpkin Festival is the biggest event of Half Moon Bay (California). That is one ridiculously large pumpkin! What on earth did they do with it afterwards?!! !